It is interesting to see how different markets are responding to the elevated levels of volatility, uncertainty and fear. Equities have been seen to bear the brunt of selling pressure in recent days, with S&P 500 options volatility (the VIX) spiking way above 20 yesterday and wild swings on equity markets. However, according to the Wall Street Journal, these market moves may not be going unnoticed at the Federal Reserve, which could be set to hike rates once more in December, but then be open to considering its options. The inversion of part of the yield curve is seemingly having an impact, but the fact that Wall Street bounced sharply into the close in unlikely to be the end of the market concerns. Although volatility in Treasury yields may have caused havoc through equities, it has done relatively little to impact on forex. There are question marks over how it will impact on the US dollar, whilst reduced risk appetite is the main impact on forex right now. Subsequently, it is interesting to see EUR/USD relatively settled, whilst the Aussie dollar has been sold sharply, and sterling traders continue to trade pretty much exclusively off Brexit headlines. How Non-farm Payrolls adds to this whole picture is an intriguing factor. The dollar is likely to trade in its usual direction with any surprises, but how risk sentiment is affected could be perceived in different ways. If yesterday’s Wall Street reaction to the Fed potentially holding off from rate hikes is anything to go by, then a negative report could be positive for risk. However, in these uncertain times, with traders’ heads already spinning, anything could be possible. Wall Street closed an incredible session in mixed territory, with the S&P 500 -0.2% at 2696, with futures a shade lower again at -0.2%. Asian markets took the Wall Street rebound to close broadly higher (Nikkei +0.8% and Shanghai Composite flat). European markets are going for a sharp rebound with FSTE 100 futures and DAX futures both around +1% higher. In forex, there is a mild edge of dollar outperformance in front of Non-farm Payrolls but little real direction so far. In commodities, gold continues to inch higher, whilst oil is a percent lower amidst uncertainties over OPEC production cuts. The focus for traders today will be Non-farm Payrolls, but in the morning, first up is the revision for Eurozone GDP in Q3 at 1000GMT which is expected to stay at +0.2% (+0.2% in prelim). The US Employment Situation for November is at 13330GMT with the headline Non-farm Payrolls expected to be +200,000 (down from last month’s 250,000). Aside from jobs growth traders will be looking out for wages growth with Hourly Earnings Growth which are expected to grow by +0.3% on the month, which would hold the year on year growth at +3.1%. The Unemployment rate is expected to remain at the Fed’s 2018 projection of 3.7% (3.7% in October), whilst it is also worth watching the U6 Underemployment which fell to 7.4% last month. Traders will also be interested in the prelim University of Michigan Sentiment at 1500GMT which is expected to fall to 97.0 (from a downwardly revised 97.5 last month) which would be a third month of decline. We highlighted the selling pressure through the commodity majors with the sharp EUR/AUD rally yesterday, and this is something that has also shown strongly through EUR/CAD. After initially rejecting the test of key resistance around 1.5135 last week, there has now been a run of three strong bull candles in a row to smash through the resistance and make a key breakout. The move to a new two month high with such conviction is a move not to be ignored. The breakout at 1.5235 is now a basis of support being price breakout, the flattening 1444 day moving average (which has previously been a basis of resistance) and the broken six month downtrend which is now supportive. This comes with the momentum indicators increasingly positively configured with the RSI at six month highs (but also with upside potential in the mid-60s), whilst MACD and Stochastics lines are increasingly positively configured now. This all suggests that once the stretched exuberance of the rally has unwound, corrections will be seen as a chance to buy. Any unwind into 40/50 on the hourly RSI that builds support would be an opportunity. As the market has continued its recent consolidation there is now consistent testing of the downtrend channel resistance, to the point at which the channel is essentially being broken. That is good news for the bulls as it would suggest that the bearish pressure is dissipating. 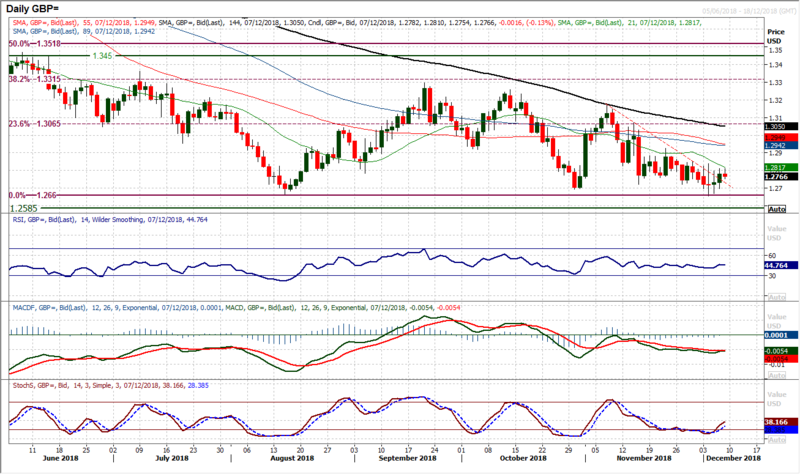 The support at $1.1300 has held throughout this week as the market builds above $1.1265. The mildly positive candle from yesterday’s session included another test higher which the bulls just could not quite hold on to, but a test of $1.1400/$1.1430 still remains in prospect today. There is still a neutral configuration to momentum, with the Stochastics stabilising to reflect this period of relative calm on EUR/USD. The caveat to this consolidation is a payrolls report which will add a degree of near term volatility. 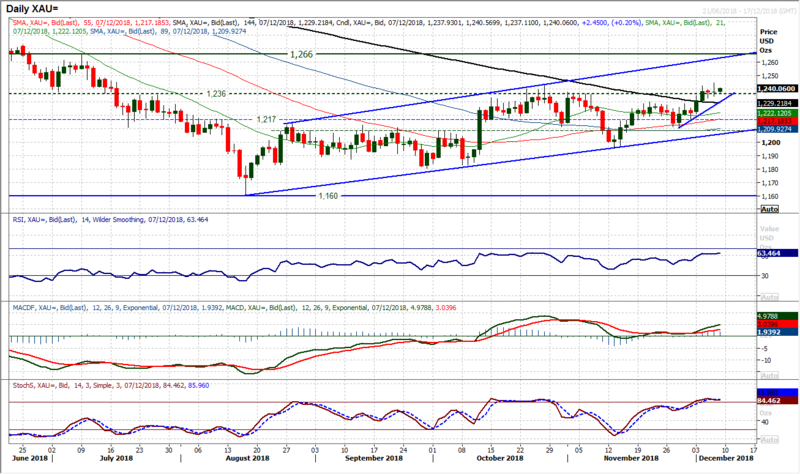 A close above $1.1400 would begin to generate positive momentum again, whilst above $1.1470 is bullish. It was interesting to see that Cable continues to hold on to the key medium term floor at $1.2660 and has even posted a positive candle (something that is rare in recent weeks). Breaking a four week downtrend is also a positive, whilst this pick up is also reflected in the Stochastics ticking higher. Despite this though, there are very few reasons for being long Cable on a near to medium term basis, both technically and for that matter fundamentally with so many Brexit uncertainties. There is consistent resistance overhead, initially at $1.2840/50 and then $1.2925 and whilst the momentum indicators may not be as negative on a near term basis, the medium term configuration is still very much to suggest that rallies will fade. 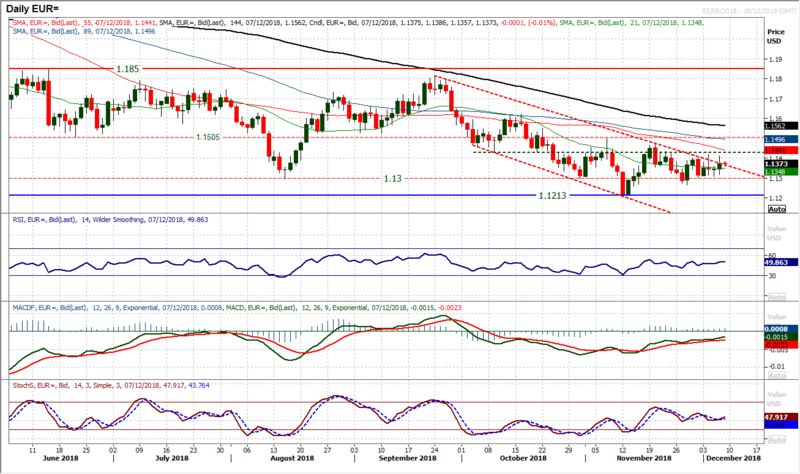 However, whilst the floor at $1.2660 remains intact there is hope. Initial support at $1.2695. 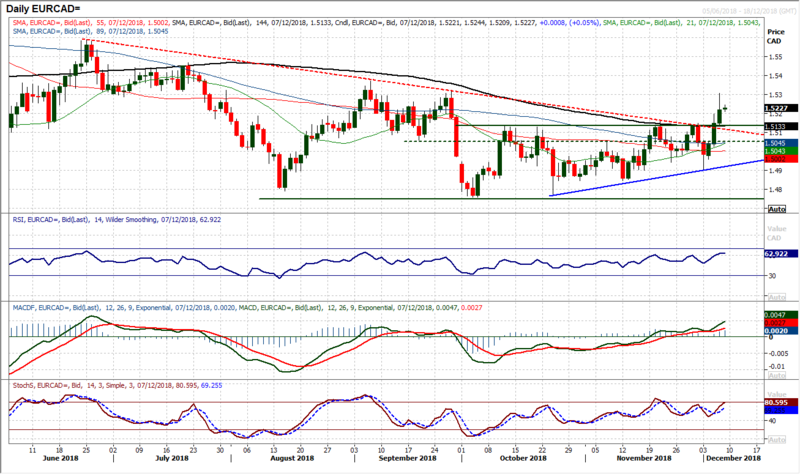 After yesterday’s strong bear candle, Dollar/Yen stands on the brink of a key breakdown that would change the outlook. 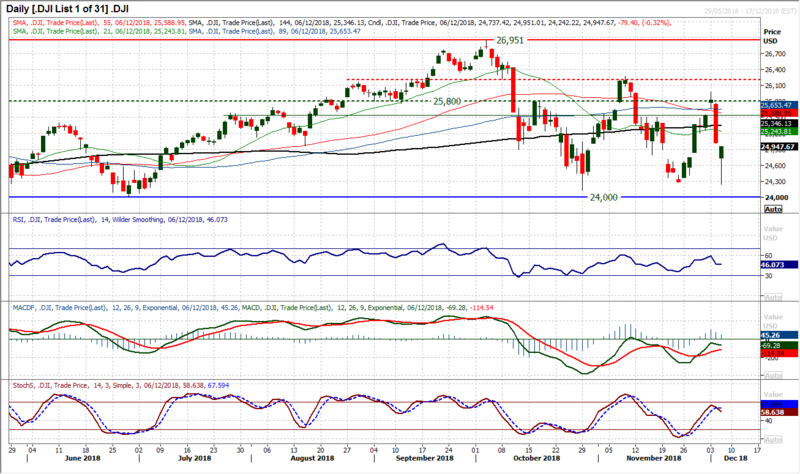 An initial test of the six month uptrend (currently 112.30) has been rebuffed, however, the momentum indicators suggest this remains a market on the edge. An intraday breach of 112.30 support bounced from 112.20 yesterday as the support held into the close, but the concern is that rallies are increasingly being sold into now. The RSI, MACD and Stochastics are all still in positive medium term configuration but are back at key levels where the bulls need to return to maintain this configuration. The initial move this morning has been positive, but resistance of a lower high (and pivot on the hourly chart) around 113.20 needs to be broken for the bulls to regain a degree of control. The hourly chart shows that this bounce today is so far just a near term unwind, with 60 limiting the hourly RSI and neutral a basis where the hourly MACD rolls over. 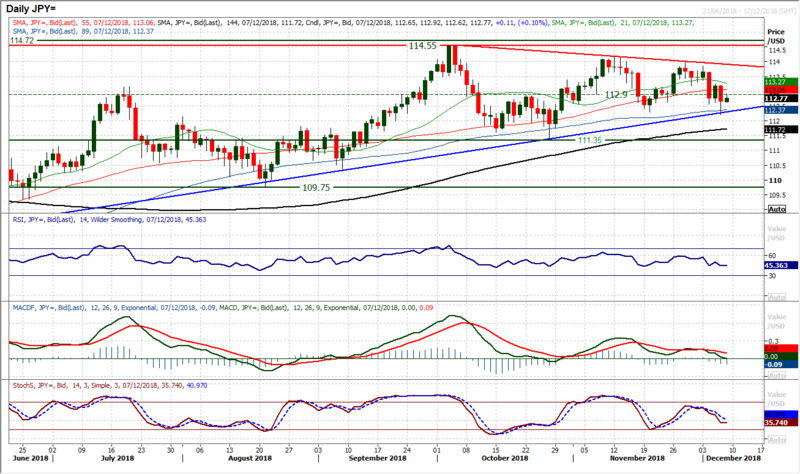 Payrolls today could have a significant impact on the near term outlook and need to be watched. Dollar negativity and risk aversion in yesterday’s session was gold positive and the breakout above $1236 continues to build support. Although the las couple of candlesticks have hardly shot the lights out, gold is testing higher and holding the breakout. The intraday move above October’s high of $1243 helps to reassert the notion that the market is now building upside traction within the trend channel towards a test of the next resistance at $1266. Momentum indicators are positively configured with the RSI positioning in the mid-60s now and the highest level since January, but also retaining upside potential. Any intraday moves lower to find support in the band between the pivot at $1236 and the previous November highs of $1230 should be seen to be a chance to buy now. The day of the OPEC meeting tends to always be a day of elevated volatility on oil and yesterday was no different. The failure for OPEC to come out with any agreement on production cuts led to a negative bias through the session and this continues into today. However the volatility is unlikely to end there, with further meetings of OPEC and Russian today. Technically, oil continues to track the eight week downtrend lower and having turned lower in the past couple of days, momentum in a recovery is beginning to suffer. 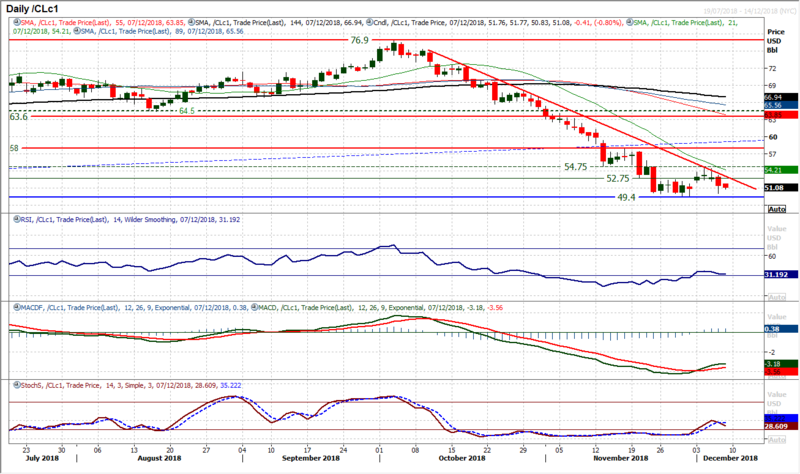 The psychological support of $50 managed to hold yesterday but the recent lows at $49.40 remain at risk. The hourly chart shows that $52.00 is now a basis of a near term pivot to watch for potential recovery and resistance is still sizable at $54.25/$54.75. The Dow closed -0.3% lower on the day, however shows almost nothing of the story of the day, with incredible volatility and wild swings on Wall Street (this is why we use bar/candlestick charts and not line charts). Essentially a massive bull hammer candlestick has been formed, however, anyone who takes this as an unambiguous buy signal is a brave trader. 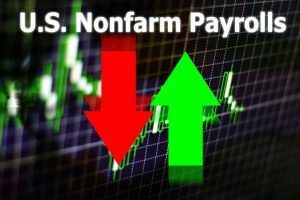 The likelihood is that it simply reflects the frantic uncertainty of the herd in the market right now and the volatility is unlikely to dissipate much with payrolls today. When volatility is so elevated, as it has been in the past two sessions, calling direction becomes a thankless task. There is a band of resistance 25,000/25,200 as potentially restrictive to a rally. The only real support is yesterday’s low at 24,242 which could now be the fourth key low of recent months between 24,000/24,250.